I get a private message tonight from an old friend who I’ve missed, it was great to hear from her. She says she has been reading the blog and recently started her own. But besides wanting to just say hello and reconnect, she asked ..
‘Two questions, first: What are the best socks to wear in cowboy boots so they don’t slouch down?’.. The other question will be for a later post. I need to think a lot harder about answering that question, than this one. So this gets my attention tonight. Plus, I think its hilarious. In part, because I’ve never really thought about it. The Cowboy laughs when I ask him. What do you wear underneath those .. boots. Now I’m laughing. I’m thinking, whens the last time I heard someone even say ‘tube socks’? Might have been, like 7th grade. And boy did we used to wear tube socks. We didn’t just wear them, we rocked ’em. Remember tube socks with the old basketball uniforms where the shorts were short and made of real thick polyester? Wow, got off track there for a moment. Gold Toe is what his pop wears. 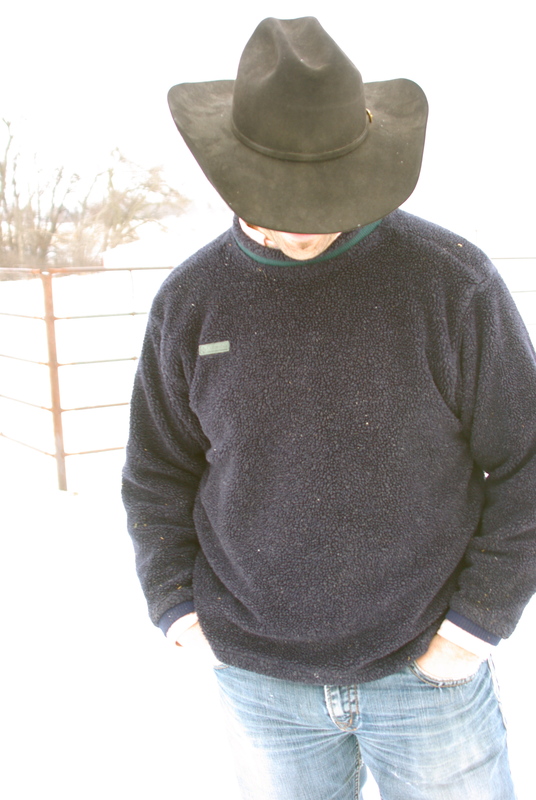 The Cowboy says his fav is Omni-Wool. I’ve worn boots myself since I was like, at the very least in college. 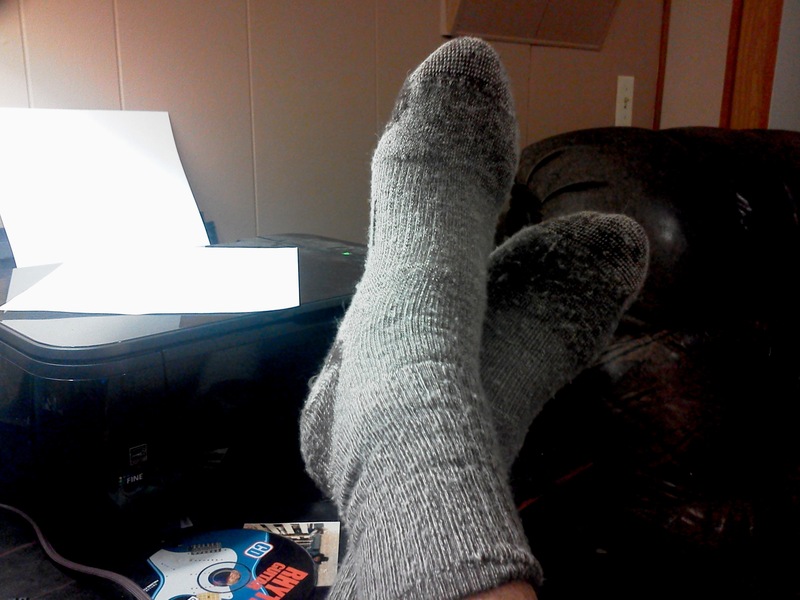 And I just get any old ‘tall socks’. Most women’s tall socks have the thicker, tighter band around the top of the sock.. which, the tag should explain to you that’s why its there. To prevent slippage. At this moment, I’m now laughing at myself. That I am thinking so much about an issue that might otherwise seem trivial and relatively funny. 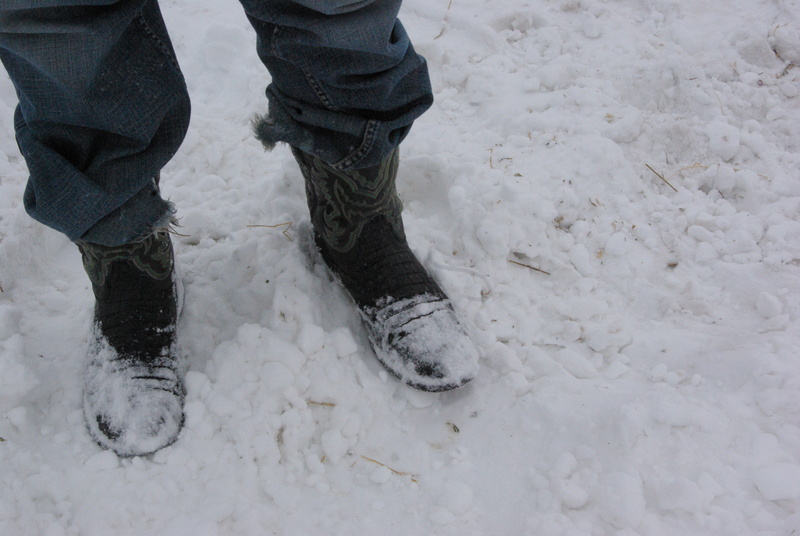 Perhaps more important than the right pair of socks .. let’s just say we need to start with the right pair of boots. We happened to be at one of my favorite stores in Bozeman, MT http://www.headwestbozeman.com/ on a trip late last summer .. when I realized I might not be doing this whole cowgirl thing right. “What do you think of these?” says the Cowboy. I turn around and he’s holding up a pair of black boots. 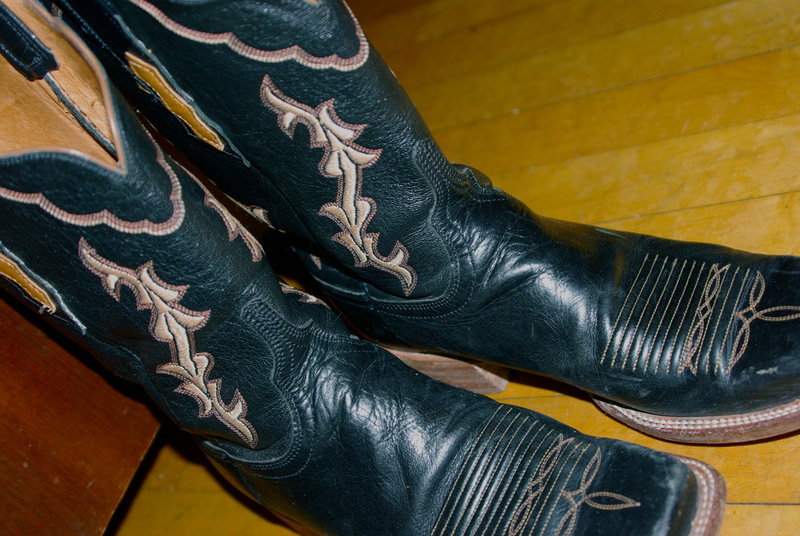 Those black boots at Head West, they were in immaculate shape. They were in the back of the store, 2nd hand. And, they were just my size. We left that day with me at least looking one step closer to a real cowgirl. Not that I was trying. But if I’m hanging with a real cowboy, perhaps its important to not look like a rookie. My pointy toed boots (which I love, especially the handcrafted ones from Austin) still stand tall in my closet however, and it appears I may actually be changing the Cowboys opinion of them. But I am amazed how often I get stopped wearing the square toed boots by people wanting to know where on earth I got them. Wet boots. Haven’t tried that yet. So much to learn … good luck with the socks. P.S. My daughter and I after the blowout last eve, had a fantastic day. We made it to school on time. She helped with chores. She did her homework when I asked. She started a dance class she loves and is grateful I got her enrolled. And we had a nice quiet night at home. Calm has once again found our household. For now…. For whatever comes next, even she is equipped with the right pair of very cute, tall orange square toed boots.